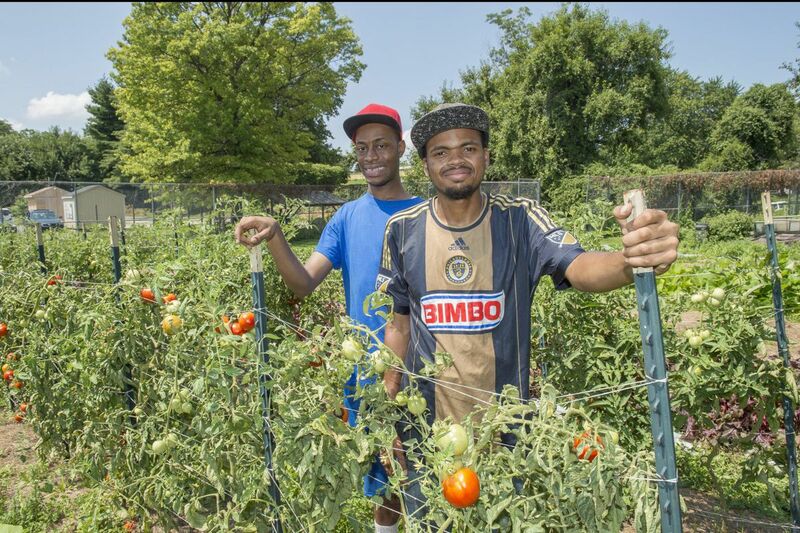 Summer Interns Denzel McFadden (left) and Kendall Harris-Burton among tomatoes at Hope Farm on the grounds of Martin Luther King High School. As rain poured down around the kitchen and classroom building at the Awbury Arboretum in Germantown last week, dozens of teenagers lined up near the stove and helped themselves to slices of tomato with basil and spoonfuls of barley and black lentil salad. One high school girl wandered by with her plate and asked whether anyone knew where the composting heap was. Jill Fink smiled with pride. "Just to hear them asking where the compost is, I love that," she said. "And look, there's no meat in any of the dishes, they're coming back for seconds, they made it all themselves. You don't hear any complaining." Margaret Guthrie, a Hope Farm volunteer cuts tomatoes for a tomato, basil, and mozzarella salad at Hope Farm in Philadelphia. Fink is executive director of Food Moxie, a nonprofit offshoot of the Weavers Way cooperative food markets that is celebrating 10 years of encouraging communities to enjoy healthy food. The organization, which started with the goal of increasing access to fresh ingredients, has since built a catalog of programs offering everything from gardening lessons for children younger than 5 to classes that help parents learn how to cook healthy food on a limited budget. Last week's event at the nonprofit Awbury Arboretum, one of Food Moxie's many community partners, was the second annual daylong conference for about 80 teenagers who participate in urban farming programs around the city. Planned by the students who participate in Food Moxie's summer program, it featured lunch made with ingredients harvested from Food Moxie's nearby garden, such as tomatoes, cucumbers and herbs, talks from guest speakers on food- and nature-related topics, and workshops during which students made take-home favors, such as a hair conditioner made with strawberries and coconut oil. "Food is a big part of how we experience the world," Fink said. "And we want these programs to show what's possible, what's out there." Food Moxie began in 2007 under the name Weavers Way Community Programs, with the goal of complementing the community outreach being done by the cooperative markets. When Fink came on as executive director in 2013, she led the creation of the agency's first strategic plan, and she and others spent close to a year looking at where they could fill in gaps in other social service programs. The agency was renamed last year. Funded largely by foundation support and individual contributions, Food Moxie's 8-person, permanent staff has tripled in the last four years, said Fink. The organization served more than 700 children, students, and adults last year, a number that Fink said allows the agency to provide services to each member of a family, regardless of age. Food Moxie, headquartered at the Weavers Way Mount Airy store, has expanded to include several locations, each of which offers a variety of programs. One of them is Hope Farm on the grounds of Martin Luther King High School, which began in 2014 with the goal of teaching urban farming and nutrition to students with special needs such as autism. The organization also maintains Hope Garden, next door in the backyard of the Stenton Family Manor, an emergency temporary homeless shelter that has become one of Food Moxie's strongest partnerships. Since 2009, Food Moxie has offered classes and workshops for families, teens and adults there through its Hope Kitchen program, which focuses on nutrition, healthy eating, and shopping on a budget. Summer interns Kendall Harris-Burton (left) and Denzel McFadden carry weeds out of the Hope Farm plot. "Food is the starting point, but it's really about having a sense of confidence," Fink said. "At a pretty low point in their lives, to have something that gives you a sense of self-esteem, that goes a long way. Cooking can be therapeutic, gardening can be therapeutic. It's an opportunity for them to feel more like themselves." In addition to other teen-focused programs, Food Moxie runs a youth development program through W.B. Saul High School for students interested in agricultural sciences. Brandon Ritter, Food Moxie's garden and farm manager, grew up near the arboretum and got involved with farming at an early age, helping his grandmother in a community garden. "There were no real programs for me then," said Ritter, 23, who attended Saul High School. "It's amazing to see what's out there for kids now who have an interest in crops and farming." The students at the conference last week were mostly high school-age and came from groups that also included the Philadelphia Youth Network and the Teen Leadership Corps, which operates its own programs out of the kitchen in the arboretum. The conference offers opportunities for them to brainstorm about topics like food access and food justice with like-minded teenagers, Fink said. Cantaloupes ripen at Hope Farm. Cenay Harrison, 17, a rising senior at A. Philip Randolph Career and Technical High School who is part of Food Moxie's summer course, said she was surprised by the breadth of the program. "I thought it would be all farming, getting dirty, digging with shovels," said Harrison, who aspires to become a veterinarian. "I learned about the stages food has to go through in order to grow and before you can eat it." Later, Harrison helped lead a group of girls in a workshop making body scrubs and face masks out of all-natural ingredients. Students make beauty products from edible ingredients at a conference for teenagers, co-sponsored by Food Moxie. Kayla Clowney, a 14-year-old rising sophomore at Agnes Irwin High School who took part in a pickling workshop, said the summer courses opened her eyes to the differences between healthy and processed foods. "Before, I wouldn't really think about it, what I ate," she said. "I'd just grab something from the store. Now, I know how to make something healthier, what's better for me."